I love Christmas. I love all that the holiday represents. While the Christmas spirit is something that should be carried in our hearts year-round, I love the special emphasis during the holidays. I am so thankful that my Savior came to earth and was born in a humble manger so that I could be blessed to have the opportunity to spend eternity with Him. In the midst of the Spirit of Christmas, there are so many great ways to celebrate. Time shared with friends and family. Yummy foods to keep spirits (and tummies) warm and full. Glittering decorations that seem to bring a smile to your face. I just love it all! Hands down in its my favorite time of year! Speaking of decorations, I cannot wait until a time comes where I can do a little more decorating throughout the house but for the time being, everything is concentrated in the living area as with a 2 1/2 year old having a lot of breakables around isn’t a good idea. In the meantime, I will enjoy what we have! I love our tree that stands in the middle of our front windows in the living room. 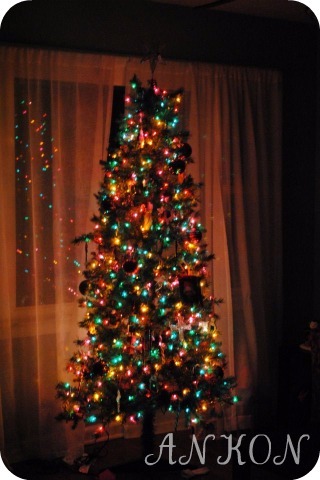 I totally noted that we are in need of a lighted tree topper for next Christmas but I still love it. As we decorate the tree, I love all the memories that are tied to so many of the ornaments that hang on the branches. I think my favorites are the handmade ornaments that Abby has created over the last 2 Christmases. I cannot believe this year is her third Christmas as time seems to have passed so quickly but I think this year will be so much fun as she is at the age where she is so excited about everything Christmas. She squeals with delight at the sight of Christmas lights. She sings the songs in her beautiful little voice. Most importantly, she’s beginning to learn the reason for Christmas. This nativity scene is probably one of my favorite things to put up when decorating for Christmas and I was so excited when it was passed down to me from my parents when we got married. I cannot remember a Christmas growing up where this nativity was not placed in a place of prominence during the holidays and always, always with a cross as you cannot fully understand the meaning of Christmas without knowing the meaning of the Cross. The set is probably close to being as old as I am and although Mary seems to be missing a hand, I hope it stays around long enough to become a part of Abby’s holiday memories as well. I cannot leave out my beautiful snowmen out of the decorations tour! I love that they can stay out well past Christmas but what I love most is what they represent about the relationship that John and I have. Since we began dating, every year John has bought me a new snowman for my collection. The one with the red heart was my very first snowman that he gave me nine years ago! So every year as I unwrap each snowman and place it on the mantel I can remember each of our Christmases together! The past couple years I have gotten the singing Hallmark snowmen which Abby has claimed as hers and swiped to put in the playroom (and must move with her from room to room)! What are your favorite things about Christmas? i love your nativity 🙂 one of my wisemen has had reconstructive nose surgery after diving headfirst into the kitchen sink at our other house. Thanks for sharing – a beautiful nativity! Wonder, after 20 years, if it is too late to suggest this to my husband!